Feeling ultra-thirsty during a hot, summer day? Quench your thirst with an ice cold glass of Bolero Ice Tea! Bolero Ice Tea lets you mix up a refreshing serving of ice tea in an easy-to-carry sachet. This ice tea mix features black tea that is free from artificial colors, flavorings, preservatives, and added sugars. All you need to do is pour the contents of the sachet in 1.5 liters of water and enjoy delicious ice tea unlike anything you've ever tried before! Bolero Ice Tea does not contain any calories and is a great source of vitamin C, which delays the onset of aging and strengthens your immune system at the same time. Beat the heat and unwind with a cold glass of Bolero Ice Tea! Have a question about Bolero Ice Tea? What is it, what does it do, how and when to use or something else? Ask us. 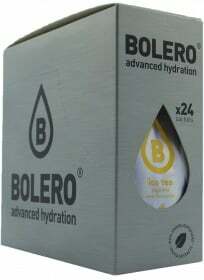 “Bolero Ice Tea 24x8g” is currently out of stock. Enter your details below and we will let you know when it's back in stock.